The build-up to Superman:World of New Krypton and another year without Superman in the super-titles finally came to an end with the release of Superman #685 on Wednesday. Written by James Robinson and drawn by Javier Pina, it moves all the pieces into proper position for the new stories to unfold. The last several issues have basically been prologue to this year's major arcs. Superman will be on New Krypton. 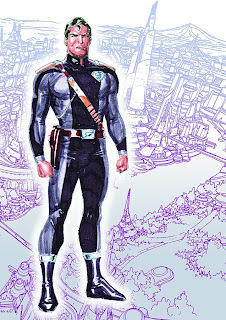 Mon-El and the Guardian will be in charge of Metropolis. Flamebird and Nightwing will be hunting whatever they are hunting. 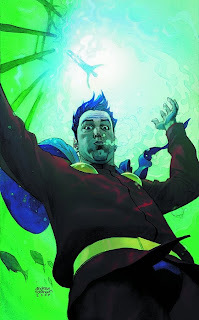 The last issue ended with Mon-El ripped from a collapsing Phantom Zone only to begin dying from the sudden exposure to lead. With Mon-El turning an unseemly shade of gray, Superman comes up with an idea. Why not go into the future for Brainiac 5's cure serum? Superman knows that Mon-El is safely active 1000 years from now. But when he tries to use his Legion ring to go to the 31st century, it doesn't work. Superman sums it up pretty ominously. "Something's wrong ... with tomorrow." My guess is that we haven't quite reached the post-Final Crisis DCU. The problem with tomorrow is that the events of Final Crisis:Legion of Three Worlds are still bubbling to the surface. But seriously, not to pick at the finaly scabbed over wound of Final Crisis, when will the DCU move to the post-FC reality. 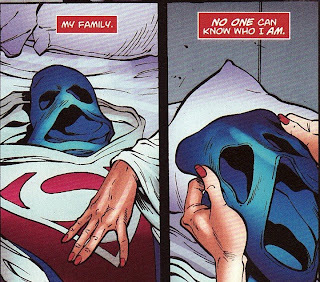 The DCU titles have been moving forward without even a glance at the trauma of Final Crisis. And assuming that each title moves ahead with current storylines will there even be a mention of Earth nearly dying, the death of some friends, the restructuring of the orrery? Hawkman and Hawkwoman and Batman all died in Final Crisis and yet all three are in the current Justice League of America issue. Heck, Hawkwoman stars in the 'Origins and Omens' back-up. Is she dead? Did New Krypton get created before Final Crisis? If so, why weren't 100,000 Kryptonians mentioned? Aftewards? Well where does Final Crisis fit in the timeline of the super-titles. I just think that after a major event .... the last Crisis ... there should be a new feel to continuity. 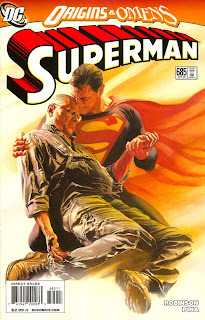 As it is, outside of the impact on the Bat titles, I feel like Final Crisis could have been an Elseworlds mini-series. Yikes, that's a lot of bile to spring forth from one panel in Superman. Sorry for the tangent. 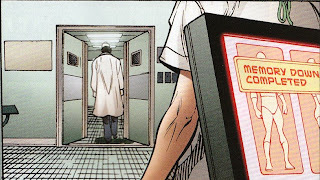 Realizing that an answer from the future won't come easily, Superman rushes to his lab to try to cobble some cure together last minute. When he arrives he discovers this 'Alice in Wonderland'-like flask, the 'drink me' label festooned with a Legion symbol. Feeling he has no choice, Superman administers the serum to Mon-El who is miraculously cured. So this save felt a bit too much like a deus ex machina. However, there aren't many people who could have sneaked into the Fortress to leave it there. My guess? Flamebird and Nightwing. There is a theory floating on the web that Nightwing is Cosmic Boy. He could have brought the anti-lead poisoning serum from the future. If Nightwing is Rokk, then who is Flamebird? What about Officer Schvaughn Erin? Now that the immediate crisis of Mon-El and the Phantom Zone is over, Superman can go back to worrying about the ongoing crisis of New Krypton. He simply doesn't trust General Zod. Superman feels his people, the Kryptonians, are in danger and he needs to be there to protect them. One thing I did like was Robinson showing us Superman's reaction to the UN resolution banning Kryptonians (outside himself) from Earth. He looks pretty shocked and he should be. 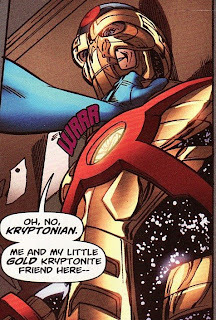 Things aren't going well with the Terran/Kryptonian relationship. More then ever, he probably feels the weight of setting things right, of being a arbitor between the two sides of his life. Robinson does give a glimpse of the Guardian as well. Harper has been receiving telepathic messages from Tellus in the form of dreams. Tellus keeps telling the Guardian that he is fine and that the Science Police will arrive. But Harper seems to ignore the advice. After seeing visions of battles with Superman villains Riot and The Atomic Skull, Harper says that he is coming to the rescue. 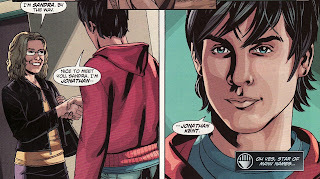 The rest of the issue is actually a nice character study of Clark. He knows he needs to go to New Krypton to watch Zod, save his people, and hopefully bring an end to the animosity between his two cultures. But he cannot do it without the blessing of the two women in his life, Ma and Lois. He begins to lay out his reasoning to them. 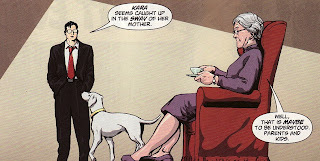 One thing I did not like is Clark saying that he felt Kara was under the sway of her mother. While she may be living on New Krypton, Kara has seemed concerned about her mother's actions as much as anyone. She has never fallen in line with Alura's thinking like a good little soldier. I did like the little split panel theme seen above. He truly is half Clark and half Superman. It is a nice little visualization of that, as both sides of him are in anguish about how things have unfolded. I love the support that Lois and Ma give him. When Superman states that he doesn't know what to do, they both say 'yes you do'. They both know he needs to leave Earth and go to New Krypton. 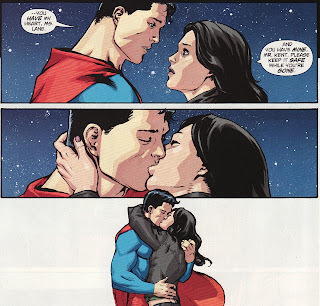 The issue's main story ends with a tender goodbye between Lois and Clark. 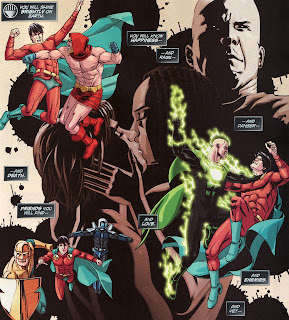 I am happy that Robinson took the time to show this, as well as Lois' tears after this goodbye. Superman is flying into the lion's den. Lois doesn't even know if he will ever return. And yet, she still knows his place is there. She has faith in him, sure, but that still requires bravery in her part. The issue ends with a nice 'Origins and Omens' story reviewing Mon-El's history succinctly and setting him up for the next year in Superman. First off, he gets an identity for Metropolis. He will be Jonathan Kent. Nice touch. And he looks like he will be busy too. Fights with Atlas and Sodam Yat? Tangling with Lex Luthor? And what looks to be a kiss with Natasha Irons? I have to say that I am most intrigued with Superman:World of New Krypton. Of all the directions of the super-books, Superman starring Mon-El and The Guardian is the one that I am least optimistic about. Hopefully I will be pleasantly surprised. As for this issue, Robinson does a fine job of aligning the characters so next month will start smoothly. It still felt more like set-up than story progression, but you have to get to the beginning of a story somehow. I don't know Javier Pina but his work was serviceable. Certainly it is much smoother than the dark stuff we saw by Jesus Merino and Pable Raimondi recently. Raimondi's stuff looked much better in this month's 'Origins and Omens', less blotchy and thick. Okay, we have now digested several issues with Superwoman and we are two months away from a reveal. Is it time for another poll? It is apparent that my earlier poll included some choices that just don't fit anymore. Both Sterling Gates and Jamal Igle have said that the woman under the mask is someone we have seen in the comic and not a surprising newcomer from out of left field. Here is Jamal talking about Superwoman on Newsarama (http://www.newsarama.com/comics/020918-Igle-Supergirl.html). With that caveat, guesses like Lesla Lar and Luma Lynai seem unlikely now. Judging by recent discussions on line, Thara Ak-Var and Alura have suddenly become a vogue picks. But the 'is she Kryptonian?' question from Supergirl #38 has made Lucy Lane, Cat Grant, and Lana Lang suddenly be back in the mix. 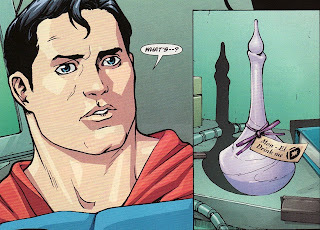 Of course, how they would know Kryptonese, be on Kandor, and have powers is beyond me. 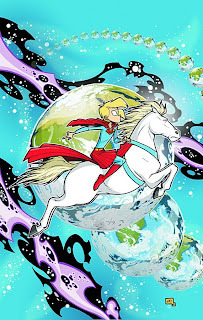 And Maxima, Power Girl, Daxamites, robots, and Amazons ... all as non-Kryptonians (or non-Earth-0 Kryptonians) ... are new dark horse candidates (although perhaps violating the creator decree above). 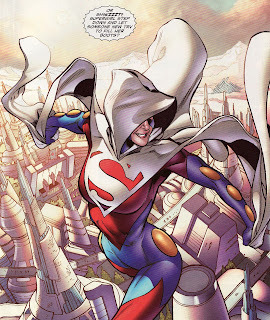 All along I have said that Superwoman is a Kara clone of some sort. Now I have changed my mind. I think Superwoman is an Alura clone, probably brought on by exposure to Black K radiation when purging the poison from Kara. If I have changed my mind then maybe it is time to review some of the key panels and clues and start up a new poll. The guesses are Alura (in any form - real or Black K clone), Kara (in any form - clone, Black K, etc), Thara Ak-Var, android/robot, Lucy Lane, Lana Lang, or other. As I review the issues, I will put in some of my thoughts on specific clues .... whether they be real or red herrings is up to the reader. I will put down who I think specific panels point to as well, even if I contradict myself. No matter what you think of my ramblings, I hope you vote. And as always, I would love to hear why people think what they think, especially if you pick 'other'. And since this is a big review of panels and clues, this is a very very long post. So bear with me. We got our first glimpse of Superwoman at the end of Supergirl #35. It is clear that she is in Kandor. I looks like she has long hair that is either brown or blond. I find it interesting that her transmission here includes some shorts with the 'kzzzt' noises. Why would that be? Is she a robot of some sort herself with faulty technology? When someone speaking Kryptonese cries out for help, she is off. Nice flying style gripping the cape like that. Reminds me of someone else. 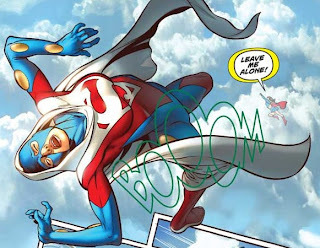 Look ... Alura flies like Superwoman (here a panel from Supergirl #37)! Maybe that doesn't mean anything. Or maybe it is a visual clue. Our next long look at Superwoman is in Supergirl #36 which is smack dab in the middle of the New Krypton arc and includes the crisis of Zor-El's death. I include this panel to show that Thara was a pretty big presence in the battle even semi-saving Superman at one point. This comes into play later. 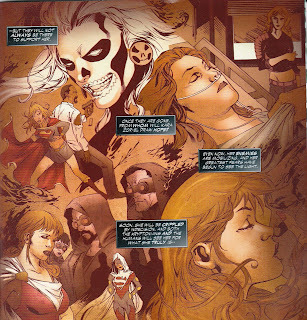 After Zor-El gets killed, Alura becomes more and more despondent and militant. Remember, she was struck by a bolt of K-poisoning in Supergirl #35 which some of us have used to rationalize her change in mentality. Here we see her grieving. I said I have changed my pick from 'Kara clone' to 'Alura clone'. So I wonder if she was literally beside herself with grief and anger. Maybe the Black K in the bolt split her? Maybe one Alura is depressed, one militant? But this is a Superwoman post. So let's move on to panels involving her. 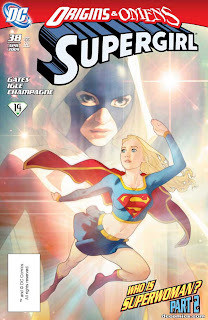 In Supergirl #36 she approaches Supergirl and is almost overly friendly. She speaks fluent Kryptonese and states she is just learning English. Kryptonian powers can be emulated with technology. But speaking an alien language fluently? Does that eliminate the humans from the top of the suspect list? Certainly it makes Thara, Alura, Lyla Kam-Par (Alura's secretary), and a Kara clone better suspects. The powers, the language, the location ... it all says Kryptonian. And then this little piece of propaganda. Superman and Supergirl were the inspiration to put on the uniform and fight for what is right? I don't know who could state that truthfully. Thara makes some sense. Maybe seeing what the cousins have done on Earth would make her want to become a hero. Remember, Thara stated that titles should be 'earned'. 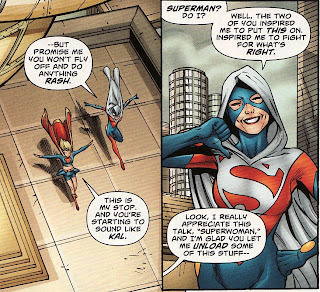 Maybe she resents Kara becoming a hero more by a whim than true training. But who else could say that and mean it? Or is that just a bunch of lies to get close to Supergirl? As she flies off after that conversation, she says she hopes to see Kara again back home. Look at how home is highlighted. Does that mean her current Earth home - is Superwoman Lana? Her Kryptonian home with Alura? Or just home as in New Krypton? Right now I think I means 'home with Alura'. Or at least one of the Aluras. Our next sighting is in the last chapter of New Krypton, Action Comics #873, where she dispatches Agent Liberty with a heat vision lobotomy. This is the first time we see that Superwoman is working with General Lane. 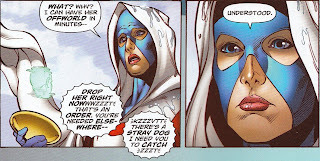 Look at how icily she states 'intruder alert' after killing Liberty. These two words made the idea of 'robot' or 'android' plausible. The red eyes do give her an inhuman feel. 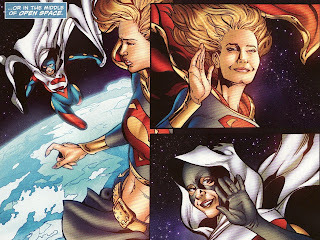 After that brief appearance, we see a lot of Superwoman in Supergirl #37, the Faces of Evil issue. The issue opens up with Superwoman padding around a dusty room I am assuming is on New Krypton given the decor. Why a dusty room? My guess is it means that Superwoman is in hiding even amongst 'her people'. Who would need to be in hiding? What about a copy of someone who is very visible on New Krypton like Alura? Or Kara? She says she wants to help her people but it seems disingenuous given events that unfold. But she may be sincere and deluded. But maybe the Els are her symbolic family, like someone who is very close to them. It could still be Thara. Thara would have a hideout to change into her uniform so she could remain undiscovered. You probably can't be the head of security on New Krypton and be a masked vigilante. Despite her intention of helping her people, somehow Superwoman has become a pawn of General Lane who seems to be blackmailing her with his knowledge of her identity. Who would be so worried about that reveal to basically become a traitor to her people and a killer? Well someone who would be killed or otherwise erased if she is found out (like a clone or a copy). I don't think Thara would be so concerned over this reveal to help Lane in his murderous plans. But how does Lane know who she is? I have no idea. Of all the clues, this seems to eliminate Lucy Lane for me. Lucy seems eager to obey General Lane's every order. Why would her father need to blackmail her? 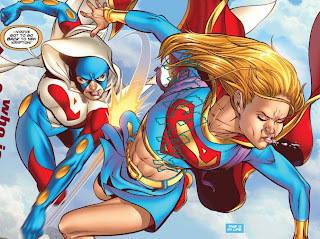 I include this panel of Supergirl and Superwoman soaking in the sun because Kara describes this activity as 'running into an old friend' just as Superwoman arrives. Is that a sly hint that Superwoman is in fact Kara's old friend Thara? Maybe Lana? That is a nice literary device. 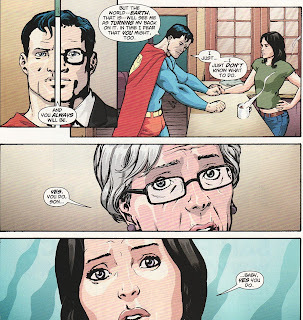 This panel shows that Gates has made a point of telling us that Superwoman possesses unbelievable speed. Super-speed is the great equalizer. If I say 'Superwoman can't be Thara because Supergirl runs into Thara right after this conversation with Superwoman ends', you can counter 'Thara changed at super-speed.' If I say 'she can't be Alura because she would need to be 2 places at once' you can counter the same way. Of course, like the best mysteries, this could be a complete lie, placed there just to let people rationalize their guesses. Of course, she can't be the Alura unless she has a true split personality. 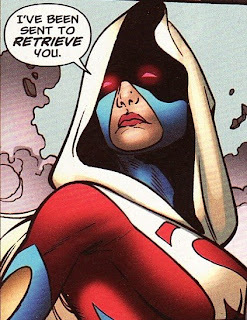 Here Superwoman states that she was against Alura's decision to move off Earth. 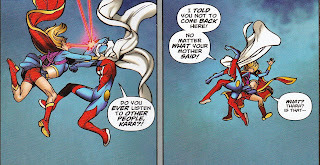 Throughout the story, Thara has been somewhat critical of Alura's decisions. So Superwoman has similar sentiments to Thara. After Supergirl gets sent to Earth to bring in Reactron, Superwoman tries to stop her. But it seems to be more out of concern for Kara than anything else. Thara had disagreed with this mission from the start. As a member of the military, she would have the fighting skills to square off with and defeat Supergirl. But an Alura clone who has a different mindset compared to 'Alura-Prime' might also want to stop Kara. 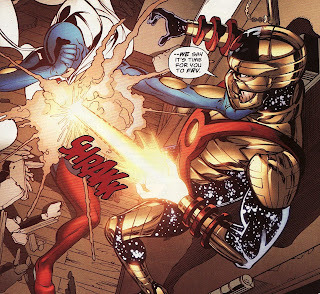 Reactron killed Zor-El; maybe Superwoman is trying to save Kara from a similar fate? 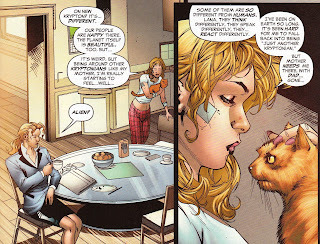 After reading Supergirl #37, most clues seemed to fit Thara more than anyone else. Supergirl #38 also seemed to point to Thara. During their fight, Superwoman speaks as though she took part in prior conversations on New Krypton with Kara. She speaks just as Thara spoke. 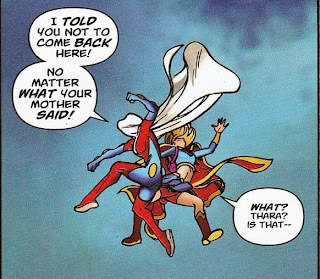 Heck, even Supergirl thinks Superwoman is Thara. Regardless of her motivation for stopping Kara, Superwoman remains obedient to General Lane. There are some intriguing elements to the above panels. First off, we continue to see the 'kzzzt' shorts of Superwoman's technology. Why continue to add those unless they were somehow meaningful? There aren't any lines to suggest these bubbles are emanating from a speaker on this communicator. 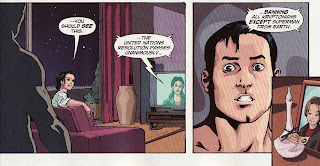 If this is how Superwoman hears, it suggests she is in fact a robot/android. I also like how her face quickly changes from raw emotional concern in the first panel to flat, almost entranced, stoicism in panel two. Does that suggest a lack of humanity? Or resignation to her role as puppet for Lane? 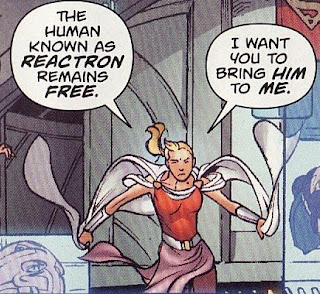 During her battle with Reactron, there are two big reveals. First off, Reactron tells us that it was Superwoman who evacuated Metallo and him from the New Krypton battle scene in Supergirl #36. It would be hard for Thara (as seen above) to be such an active part of that fight, side by side with Kal, and still fly the villains away. 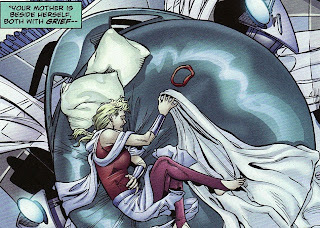 I also think it would be hard for Alura, also enmeshed in the fight and cradling Zor-El's body, to disappear with the bad guys. 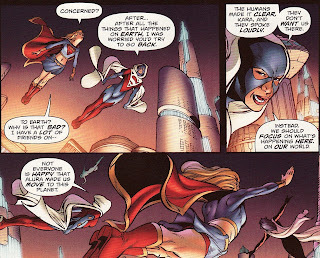 Nor do I think Thara or Alura would help Zor-El's murderer escape. 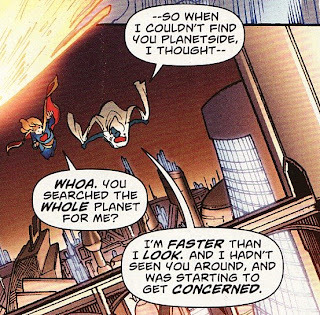 Of course, super-super-speed could be used to apparently be in 2 places as once. And we know Superwoman claims to be really fast. Ack ... that's why these mysteries are fun and frustrating at the same time. And then the big statement questioning her Kryptonian heritage. I, for one, think she is Kryptonian and was somehow protected from Reactron's gold Kryptonite. But if she is telling the truth than Alura, Kara, and Thara are eliminated (unless clones and duplicates aren't really Kryptonian). Then we are back to looking at Lana, Lucy, and other long shots. So where are we in all this? 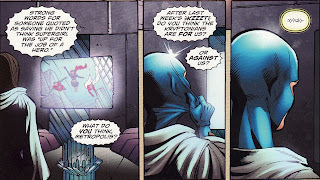 I think some form of Kara (clone, Black K, future) can explain most things but not all. I think Thara fits many clues but seems too obvious. That is a pretty lousy reason to write her off as a prime suspect. I think some form of Alura (for me Black K created) but not THE Alura makes sense too. I am guessing this. But a robot/android of Kryptonian design could explain everything - language, powers, location, and immunity to Kryptonite. And many of the other guesses - Maxima, Artemis, Lesla Lar, Matrix, Linda Danvers - all still sort of fit but seem less likely given the creative team's statement that the character has been seen before. If you are still reading ... thanks so much for dealing with my run-on thoughts. I hope you will vote. 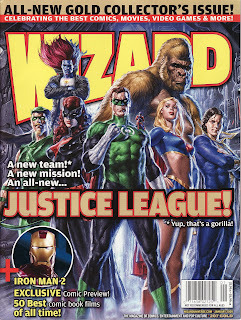 But on rereading the battle, I saw a couple of things worth posting which I did not include in my review of the issue. First off, after breaking into Lori's apartment, she gives Reactron the 'red eyes' look. This is the third time we have seen this look (I think). 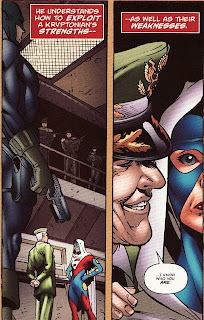 The first was when she calmly said 'intruder alert' and subsequently lobotomized Agent Liberty. The second, right before her fight with Kara. The first time I saw it, I thought it was her in 'heat vision' mode. But others on line wondered if the look and the statement might mean Superwoman was a robot/android. Does this second appearance while uttering another order from General Lane sway anyone into thinking Superwoman is a robot? Maybe she is more like a Nexus 6 replicant from Blade Runner? Synthetic but close enough to a Kryptonian to pass she could pass one of them on New Krypton? 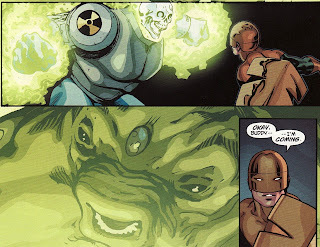 I did want to point out that Reactron has a gold K heart just like Metallo has green K. Here, you can see him open the window (little whirring noise included) to bathe Superwoman in it's radiation. During the New Krypton arc, we saw this work pretty quickly and efficiently. Just a second or 2 of exposure meant instant vulnerability. The question now is does a lead-lined suit block enough radiation (although eyes/mouth open) to render it negligible? Or does her lack of response truly mean she is not Kryptonian? The truth is we don't even know if her whole suit is lead-lined. In fact, we don't even know if her cowl is lined with lead or simply some other xray-defying element. When Kara can't see through it, she asks 'what is that lead?' My guess is that even if the whole suit was lead lined, the opening in the cowl would make her be effected. 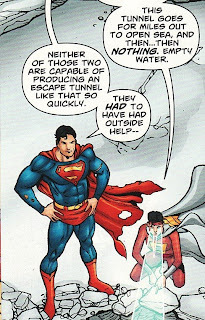 In Superman issues when he dons a lead suit, it usually covers him completely. The other half of this therefore is that I don't think this is a Gold K radiation blast. I think this is just a plain and simple nuclear/stellar bolt that Reactron could shoot prior to his Gold K upgrade. It does mean that whoever or whatever she is, Superwoman is tough to take a shot by Reactron to the chest at point blank and still smile. My hope will be at some point to put up another poll about 'who is Superwoman' now that we have some more info. You have to give Sterling Gates and Jamal Igle some props. They certainly have us guessing. 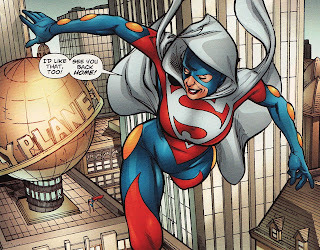 We hit the halfway point of the 'Who is Superwoman?' arc in Supergirl #38, released last Wednesday. What was interesting about this issue was that we not only moved the Superwoman plot forward with a some mind-numbing reveals but we added a few new plot threads to the mix. All that and an 'Origins and Omens' look at Supergirl with a few interesting peeks into the future. 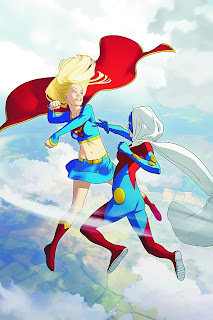 Newsarama already showed us the first few pages with the mid-air brawl between Supergirl and Superwoman. What I find compelling about this interaction is that Superwoman seems to have the best intentions in mind for Kara but is going about it the wrong way. Throughout the fight she just keeps telling Kara that she wants to return her to New Krypton because 'who knows what is happening there'. 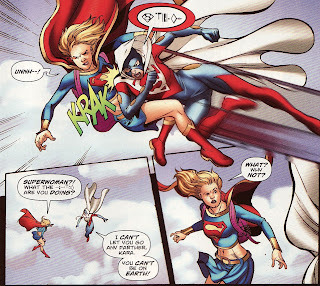 The fight isn't very long with Superwoman getting the upper hand and knocking Kara unconscious. But not before Superwoman says 'I told you not to come back here. No matter what your mother said!' Kara recognizes the line as pretty much the conversation Thara had with her in Supergirl's room on New Krypton. But before Superwoman can return Kara to New Krypton, she is contacted by General Lane. She is ordered to dump Supergirl's body right there and pick up a 'stray dog'. Superwoman follows the orders and dumps Kara into the ocean. Eventually we see Kara limp home to Lana's apartment, covered in bruises and clearly dazed. We cut to Metropolis where Inspector Henderson is performing the autopsy on Agent Liberty in hopes of downloading the memories from his integrated super-suit. 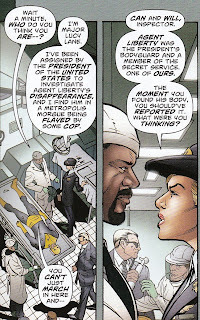 Before much can be done, Lucy Lane shows up with government orders to turn over Agent Liberty's corpse to the feds. Lucy is curt and cold, pure military bravado. But despite losing the body, it appears that Henderson's initial work might be fruitful. The suit's memory downloaded successfully. Our tour of Metropolis continues as we see Cat Grant gleefully writing a story on the UN's decree that all Kryptonians outside of Superman are banned from Earth. Of course Cat is going to love this story. It means Kara is now banished. The package holds an old-fashioned appearing sock doll of Supergirl. Cat dismisses it and tosses it in the trash. But there has to be more there. And Cat, given her history, should be wary of this package. 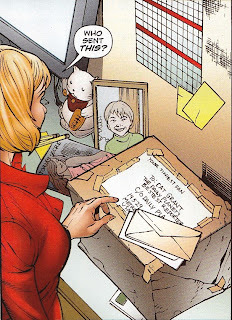 While she might think this is a prank from Kara she should really be worried that it is from The Toyman. And what better visual cure for readers than the shot of Cat's desk in the first panel. There is a picture of her son who was murdered by The Toyman. Maybe this (presumed) eventual storyline will be the way Kara helps Cat and lessens the venom between them. Ahhh, but then the big reveal! Or is it a red herring? The 'stray dog' Lane mentions is Reactron who has gone after his ex-wife. 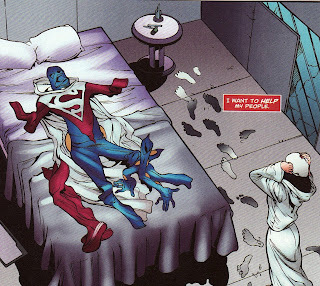 Superwoman breaks into the apartment and grabs him. 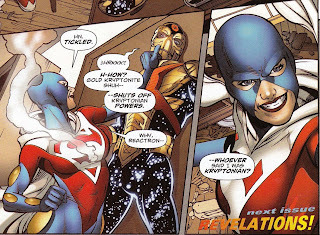 Reactron opens his chest revealing his gold Kryptonite heart and blasts Superwoman assuming it will kill her. The clues have been mounting in my mind that the best fit for Superwoman is Thara. She is a bit more physically mature than Kara. Her hair is short enough that it could easily fit under a form-fitting cowl. She would know Kryptonese and would have these powers. She might not want to obey Alura but would wish that to be hidden so she could maintain her station. As a result, she could be blackmailed by Lane. But she should be effected by Gold K, which she clearly is not. Maybe enough of her suit os lead lined to protect her? But if Superwoman is not Kryptonian, who else fits the bill? A Daxamite might, but we know it is a lead-lined uniform. Unlikely. Maxima? She actually fits. But I think she is dead. And she hasn't been see in this storyline and Igle recently said that the character is someone seen in the arc. And I think Maxima is Flamebird. 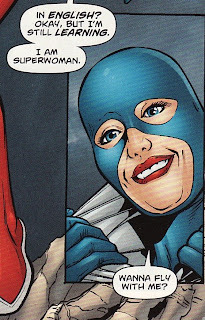 I doubt Superwoman is Lucy Lane. How would she have powers and know Kryptonese? Why would General Lane need to blackmail his obedient daughter? My latest off the wall guess (and I guess I am still stuck on 'evil clone') would be a clone of Alura. What if the Kryptonite poisoning bolt that struck her included Black K. Remember Kara was subjected to multiple types of Kryptonite. Maybe the bolt effected her as Black K has done in the past and split off another Alura. That might explain some of the contrary statements Alura has made. Some made by Alura A; others by Alura B. She would be a member of the family of El. She would want to protect Kara. She would hide out on New Krypton, staying in a dusty abandoned room. And maybe Black K clones aren't effected by Gold K somehow. At this point, I don't know what to think. I guess that is the sign of a great mystery. After that reveal we have a great 'Origins and Omens' story, written by Gates and drawn by Matthew Clark. The opening shows just how conflicted Kara is bewteen Earth and New Krypton. She has a nightmare where she is literally pulled apart by the people of the two worlds. Lana grabs her chest and spits up a small amount of blood but hides it from Kara. She tells her that Linda Lang should move home again. Looks like Lana is sick and is going to need someone to help care for her. That might be the hook to have Kara move back to Earth. Of course, given the UN declaration, she will have to stay hidden. Can anyone say 'emergency secret weapon'? But look at the visions shown in the Book of the Black Lanterns. Looks like we have a very intriguing year coming up. 1) Kara and Inspector Henderson back to back in battle formation. Looks like the Silver Banshee is going to be added to Supergirl's rogue's gallery. And a love interest? Who is that guy she is kissing? So interesting. This issue felt like a set-up issue for the rest of the year but there were enough reveals to make the Superwoman storyline go from simmer to boil. I thought this issue was great. 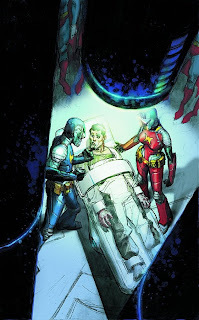 Newsarama showcased DC's May solicitation earlier this week ( http://www.newsarama.com/comics/090217-may-2009-dc-solicitations.html ). While the big buzz is over the 'Battle for the Cowl' (including a hint that Babs might walk again!? ), the Super-family remained pretty busy. And, as usual, there was a little surprise and another disappointment. Well, so much has been added to the mix with Wednesday's #38 ... review coming soon I promise. But we get the conclusion of the Superwoman story with what sounds like a major brawl. The art is being done by Talent Caldwell this issue. I put him in the Michael Turner, Scott Campbell style of art, a big difference from Jamal Igle. No worries though, Igle has already said that he is back next issue. This was a planned rest issue to work around a vacation he had planned. So it is Flamebird and Nightwing against Ursa's machinations on Earth. Interesting cover as it looks like they are about to work over/torture someone for info. Could this be the 'anti-hero' super title with Kal on New Krypton? Is it me or has the Flamebird/Nightwing mystery really taken a back seat to the Superwoman mystery? It looks like we will finally find out how Tellus ended up in Area 7734. But I hope the powerless Mon-El is a one issue or short story arc. The powerless Superman/Protector of Metropolis storyline has been played to death. I have to say that I am getting excited more and more for this title. There is such an opportunity for a character-driven Superman storyline. I know he has been raised on Earth. 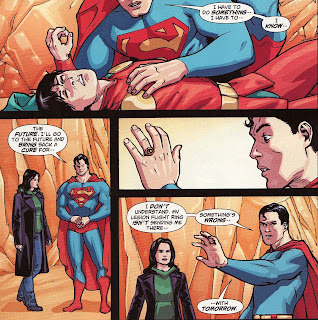 But how does he emotionally deal with this sudden insertion of Krypton in his life. How does he walk next to Zod daily? Cope with his insane Aunt? This should really be a psychologically driven examination of a man torn between 2 worlds. Sure, Kara is going through the same thing but from very different perspectives. Sure I think there will eventually be a fistfight between Zod and Kal. But the story that gets them there is the one I want to read. Hoo boy. We all have been clamoring for a Comet sighting in this book, probably since the first issue. Now, not only do we see that Comet will make an appearance but that there is an 'Infinite Earths' theme on the cover as well. This could be a poster! 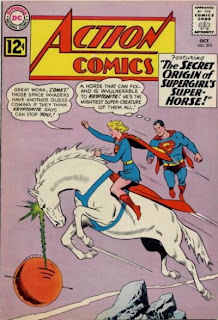 The positioning of Kara and Comet looks like the mirror image of Action Comics #293, one of Comet's first appearances. With all the other homages to Supergirl's past, I can't imagine it was coincidence. But strings of Earths? Could Walker and Jones be channeling Crisis on Infinite Earths #7 for the last issue of the mini-series? I can only hope that the title is popular enough to warrant a sequel! I am going to miss this title when it is over. 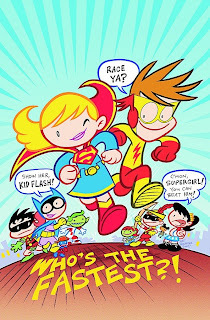 As if casting Lobo as the school gym teacher wasn't enough comedy gold for an issue, he forces Supergirl to race Kid Flash! Sounds like more fun than the Batgirl/Supergirl tea party! But why do I love this issue already? Because the cover clearly is an homage to this Bob Oskner covered Limited Collector's edition. Even the breakdown of the fans on each side is sort of similar. It is these small winks to the older readers, in Tiny Titans and Supergirl:Cosmic Adventures that truly makes the books for All Ages. And finally the disappointment. Guess what wasn't solicited again! That's right the James Robinson/Mauro Cascioli Justice League featuring Supergirl has still not been solicited! It was announced nearly a year ago! It has reached a point that Dan Didio actually needed to comment on this publicly saying that it was a mistake to announce the title until they had more issues done. Now I am sure that Cascioli's art is going to be unbelievably good. But this isn't a mini-series ... this is an ongoing monthly. Maybe they need to announce who the regular artist will be after the first arc now. Maybe I wouldn't care so much if I wasn't looking forward to the title so much. Let's hope we see it in June.